In the city of Anshan, a war memorial located in Lieshishan Park commemorates the conquest of the city by the People Liberation’s Army in 1948. It was from this city that the incredible expansion of China’s steel industry began. Indeed, North-Eastern region production was the first to be increased -thanks to the Soviet Union’s help as well. This moment of growth led total output to rise to 1.349 million tons by 1952. Lately, the Five-Year Plan contributed to boost steel production by roughly 400%. Almost 4 billion Yuan were spent in the successful attempt to expand production. But difficult times were looming. From 1958, the first year of The Great Leap Forward, to 1968 total output kept increasing but far less remarkably then the previous decade. The reasons for this slackening were related to the failed fulfillment of production targets and the misconduct of development plans. However, in the early 70s Chinese steel industry recovered and production reached 23.7 million tons. During that time, the terrible Tangshan Earthquake and the political aftermath of Mao’s death threatened the production capacity of Chinese steel mills. New leader Deng Xiaoping decided to adopt a new industrial policy by encouraging modernization and enhancement of already existing plants rather than the creation of new ones. Output quality improved and factories became more efficient, paving the way for the surge in the 2000s. Such adjustments also aimed to solve another problem, namely the import of metal products needed to create cars and machineries. At the end of the 90s, a large privatization reform was carried out and in this new dimension private-owned smelters thrived. Total output kept increasing, with more than 200 million tons in 2005 and approximately 500 million in 2010. Nowadays China is the largest producer and exporter of steel, accounting for half of the world’s capacity. Today’s challenge of China’s steel industry is reducing overcapacity. The government aims at reducing production of 150 million tons before 2020. Creating new plants in industrial regions will be more difficult, while the opening of factories is encouraged in less polluted areas. Furthermore, recent eco-friendly policies and the closing of obsolete smelters, mean that prices of steel products will rise, as it happened last year. 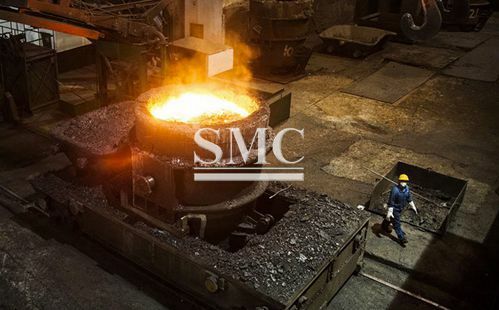 Shanghai Metal Corporation was founded in 1980 and we provide high-quality products to our customers ever since. SMC industry has developed during last thirty years and we now supply medical commodities as well. For a full list of the product, information and inquiry, please click here.